What Can We Learn From Parking Wars? If you want insight into human behavior, watch Parking Wars, an A&E reality show and don’t just watch one, watch several of them. It’s safe to assume these are edited to get the audience to react in a certain way; but, there are still patterns of behavior that are fascinating to observe. I have always felt that one of the keys to less suffering is to take responsibility for your actions. Once you take responsibility your fear of blame recedes and you can start problem solving the solution. You could write a dissertation on human behavior after watching a few seasons of this show; but, I want to talk about blame. In the show, the folks who lie and come up with a million excuses and blame the ticketing officer, blame the city and blame the government and blame everyone but themselves clearly suffer the most. The folks that shrug their shoulders and say, I knew I shouldn’t have parked there. I got caught; pay their bill and move on suffer the least. For them, they understood the risks, they took them and they lost: The end. For the other folks, it’s never the end because they are so angry at everyone else for the hole they dug either by getting the tickets themselves or lending their car out to other people who don’t take care of their tickets. The act of taking responsibility for your choices and actions ends or at least diminishes the stress and negative brain chatter. The act of blaming doesn’t relieve a person’s stress. It seems to just add fuel to their anger. These folks see the whole experience as something being DONE TO THEM. They are the victim. They also think they should fall under an exception because they are delivering something, working in the building adjacent to the parking space or my favorite, only parked there for a minute. One guy parked in a handicap spot and was quite angry he got ticketed because he was just running into the store for a minute. Stating the shortness of time was a common refrain. I think one of the differences between the folks who take responsibility and the ones who blame and make excuses is their level of empowerment. The folks who take responsibility understand that it’s in their power to mostly avoid these unpleasantries by paying attention and obeying the rules. The other group doesn’t see it this way at all. In fact, they seem to feel quite powerless in the situation which causes a tremendous amount of suffering. All of this applies to the workplace quite easily. When things go wrong, as they sometimes do, even if you work in a dysfunctional place, it’s best to own up to your mistakes and remain calm. If you can manage not to let criticism paralyze you or send you into an energy wasting defensive mode, you win even more. This attitude works with coworkers and across the service desk with customers. I have a Buddhist friend who told me about this practice she had undertaken. We were talking about blame and she said if she felt the urge to blame, under the philosophy of this practice, she would take the blame onto herself. She used the example of being driven nuts by a partner who leaves their socks on the floor and you feel like you’re constantly picking up socks. I asked how she would handle that. She said, “I’d pick up the sock and say to myself: why did I leave that here?” We laughed pretty hard at that one; but, I was intrigued by the idea. It feels so awful to be blamed for something whether you did it or not. But, it also feels horrible to blame. There is a desperate anger in the act of blaming that is a slow acting poison. By taking the blame back (Why did I leave that sock here?) you are creating a habit of cultivating compassion and shielding the person from your poison. This particular friend works in a high stress, corporate environment. We frequently talk about managing our lives at work while maintaining our openness and ability to be compassionate and empathetic. Many people would say there is no place for that in a corporate, dog eat dog, environment. My friend and I would disagree. The more risks you take (taking the blame for something so you can move on to solution finding), the less scary it becomes. Here’s my challenge: During the next week, notice how often your mind jumps to blame someone for something. It doesn’t matter if it’s about socks on the floor or losing a big client; if your mind starts hunting for someone to blame, take note of it. Ask yourself what would happen if you just skipped past the blaming stage and got to the solution part (picking up the sock or creating a team to brainstorm ways to keep good clients). 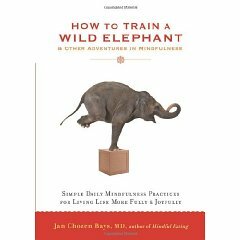 I am currently reading How to Train a Wild Elephant by Jan Chosen Bays. It is a book that contains 53 simple exercises in mindfulness. I gave a friend the book for Christmas and we are doing the exercises, 1 each week and then talking on the phone or by email to review how things went. The second exercise is called Leave No Trace. For this exercise, you choose a room or rooms of your house and for one week you try to leave no trace that you’ve been there. In other words, pick up after yourself! In my last post I revealed my cluttery past which is still probably my instincts. While doing the Leave No Trace exercise, I realized a couple of things. One is that my life has really changed in so many positive ways and I’m kind of proud of myself for just how much change I’ve managed to absorb. Becoming more organized is one of them. My apartment is much cleaner and it’s way easier to find things. Come tax time, I know that everything I need is in one place. I rarely misplace my keys and I don’t spend a lot of wasted energy looking for things or feeling like I’m constantly picking up stuff. It is sometimes hard to break habits. My coworker just the other day said, “They say it takes 30 days to change a habit.” I didn’t even have a plan other than it had become so distressing to not be able to find things and to be visually stimulated all the time with stacks of unread mail that I started doing things slowly: easing things where I could. One of the first things I began doing, now that I look back on it, was cleaning up as I went while I was cooking. It was less stressful to do it this way, even though my partner was the dishes cleaner. By the time we sat down to eat, the only dishes that needed doing were usually the our plates, utensils and maybe the pot I used. Then I started retrieving the mail and sorting it immediately: recycling, file immediately, read later, read sooner. I still use this method in an altered form. I literally stand over the recycling bin as I sort the mail. If it needs shredding it goes on a small pile that is on top of the shredder. If its a magazine, it goes on the rack with my library books. If it’s a bill (I don’t get very many bills in the mail anymore), it goes tucked into my checkbook and I leave it out on a dresser near the front door so I don’t forget to pay it. If it’s some other mail that I need to read, it goes into a drawer of such mail and a place I use to catch things I don’t know where to put until I weed the drawer at some later point. This method works for me. When I come home I hang my coat immediately. My mother, in particular, would be astonished by this development. I don’t want to hang my coat and sort the mail and put my shoes in the closet; but, I know that the extra 90 seconds saves me the aggravation of doing it later and the stress of tripping over the stuff or seeing it lying around. I put my laundry into a laundry bin, fold my sweaters and put them in the armoir and empty my pockets of change, keys, etc. This sounds kind of ….uninspired…but, it is revolutionary in my world. The exercise also made me realize just what things are the most important to me. I think the “mindfulness” part is so valuable because it got me thinking about the feeling part of leaving no trace. What I mean is….if I walk in the apartment and the kitchen island is clear and there are no dishes in the sink and no mail piling on the side table and no towels on the bathroom floor, I’m free. There is no immediate chore hanging over my head. There is no visual reminder of all that needs to be done. It’s freeing and calming. On the other hand, and I think this is a really important point, you also have to figure out what to let go of. I have a box of “accident stuff” I’ve been dragging around. Now that I live in NYC, where space is a premium, I look at that box and think: you need to go. But I don’t feel like going through all those papers and trying to decide what to keep and what to ditch. I don’t want to organize my photos which are in another box or my childhood memorabilia which is in another box! And you know what? I’m not going to. Right now, I have the lucky situation where there is space for those three boxes and I don’t have to deal with them right now. At some point, I probably will have to go through and sort stuff out. But right now, I don’t and the key to that being a good thing is to accept it and not let it hang around as some UNDONE chore. I’ve decided not to tackle them; so, it’s not a chore on my to do list at all. I encourage you to try this exercise for a week or more. If it seems overwhelming, do one thing: I’m going to hang up my coat as soon as I enter the house or I’m going to put my keys, wallet and phone in exactly the same place. I’m going to do all the dishes before I go to bed so that I wake to an empty sink. What about your disorganization bothers you the most? Tackle that one thing. Good luck. And if you like that exercise, pick up a copy of the book at your local independent bookseller! Faithful readers of this blog know most of my stories begin with the phrase before the accident or the phrase after the accident. I’ve tried to be mindful of avoiding this pattern; but, it really was such an incredible turning point. So I apologize in advance for starting another sentence in such a way. Before the accident, I can honestly admit I was a disorganized, slightly cluttered, paper piling kind of gal. There were stacks of magazines and papers with little notes I had written to myself. I struggled with keeping clutter to a minimum. After the accident, the clutter really bothered me. It created an unpleasant noise in my head similar to speaker feedback. Plus, my method of keeping reminders on various slips of paper didn’t work anymore because I was unable to untangle the chaos created by that method. What worked before, didn’t work anymore. Plus I had a million appointments with doctors and rehab therapists and phone conversations with insurance people. I got mail from insurance companies or health providers almost every day for a year. My partner helped me create a system using a calendar in the kitchen and a milk crate on the dining room table. I carried a small spiral notebook and pen in my pocket everyday (though I frequently misplaced these notebooks). It was still too much to track. I started researching ways to organize that were simple and would help me cope with the some of the memory and other brain issues I struggled with at that time. I want to share some of my process, my discoveries and resources. Evernote: I love Evernote. I have an ongoing grocery list on there. I can add things online from work or home or on the fly on my phone. That list is always with me. I also clip things while websurfing, organize recipes and various other files and images. I have a scanner set up to automatically go to Evernote and I keep documents, manuals and receipts on there. I can snap a picture of a list or business card and send it to Evernote where it is searchable by text. It’s an amazing product that is free; but, totally worth the pro upgrade. And it keeps getting better. It takes awhile to get in the habit of sticking stuff in Evernote; but, once you do it becomes a reliable and easy method of storing and retrieving just about anything. GoodReads: I joined Good Reads solely to get this app so I could easily keep track of my “to read” list and have it available when I was in a library or bookstore. Google Maps: This has proven to be invaluable. I prefer a regular print map. My visual memory is much better than my ability to remember things I’ve read (like an address) or heard (directions given verbally). But, I have found I rely heavily on GMaps. Before I head out I Google map my trip and email it to myself. That way I have it quickly accessible on my phone. Of course, I don’t have to email it beforehand. I could do it directly on my phone. I just find it nice to call it up quickly. I’ve also started using the “My Maps” feature which is also a great way to store maps you use. Putting all your eggs in one basket is a little scary. I used to back up my Gmail offline; but, I don’t do that anymore. I suppose I should and I know there are some easy-ish ways to accomplish this task. My music which is in Google Music and my pictures which are in Picasa are also backed up on my laptop and an external hard drive. I should automate this process and there are some cool tools to help with that; but, I haven’t set anything up yet. I had used a backup service that would automatically backup different folders to the cloud; but, I found them clunky. That was a couple of years ago and I should try that again. The other tool I owe a great deal of my sanity to is Last Pass: Last Pass is a password vault. It is probably the single thing that has most helped me, especially since returning to the library field. I feel like a few times a month I’m signing up for things that require passwords. There are other password vaults out there that are also good. I just happen to use Last Pass and have been pleased with it. It is a tool that I find essential. It works with most browsers and will remember all of your passwords for you. I have it set up to automatically fill most of my logins, excepting financial or other sensitive sites. I still have some memory issues and I really don’t want to waste brain energy, which I have to conserve, on keeping track of passwords or where I wrote them down. Last Pass is easy to use and has vastly improved my Internet safety because I don’t repeat passwords and I let Last Pass generate passwords for me so they are complex and safer. If I was forced to choose between giving up my smart phone or giving up Last Pass, I’d give up my smart phone without a hesitation. For me the key to success has been automation and do it once and forget about it. I set reminders and tasks in calendar. All my bills are paid automatically and I have reminders set to review my accounts and transfer money into a joint household account. I’m on top of things with minimal effort. It has been life changing. There are times I have duplication or when I also use written lists or reminders even though I also have them in Google calendar and/or tasks. I use a white board that is not attached to a wall. I prop it up wherever I need it. I’m still old school enough to sometimes want to write things out when planning a trip or project. I recently discovered iftt. This is an awesome web application that helps you automate even further. I set up a “recipe” so that whenever I star something in Google reader it automatically gets added to my Read it Later account. You could set it to have all your Instagram photos sent to Dropbox or Evernote or even your blog on WordPress. There are seemingly a million ways to use this and I’ve just started exploring; but, I suspect I’m going to love it. There are a ton more applications and tricks. I have learned the most from reading Lifehacker on a daily basis. I also read their book which is an excellent overview. In my next post, I’ll discuss the non-technology based solutions I have devised.